The first few sessions went OK. With Oulton being such a fast circuit it was unusual getting my brain back into the swing of going so fast on such a tight and technical circuit. I could tell I was de-tuned from the crash through the fast corners but that was to be expected. In the second session I changed my rear tyre compound which helped the bike drive off the slower corners and made a change to the brake pad compound to improve feel on full braking force. I also changed gearing as the settings from last year were redundant due to the new Dunlops I now run. They are a different shape and rolling radius which throws everything out slightly. I felt better at the end of session 3 but I still needed to sharpen up big time. Right on queue the rain came before the qualifying session so we had a rushed tyre change. I would usually have a spare wet bike but its currently in for repair after the crank let go so we put a wet setting in and fit wet tyres ready to go. Typically the track was right on the edge of becoming dry in some places yet splashy wet in others. I started out 10th in the wet conditions but as the session went on a dry line appeared really quickly and as people came in to change to a dry bike I had no choice but to stay out and work with what I had, 18th was all I could do as the times got faster and faster. I was livid with the qualifying position to be honest. I’ve busted a gut to get back fit as quickly as possible and at least on the bike I was fine, so to be held back by the weather was a pain, I genuinely considered canning the meeting as I didn't think I could do anything from 18th on the grid. After much deliberation I dug in and decided to grit it out, I also found a fault with the front end of the bike from my crash which left me no choice but to drive back home to Bradford to repair it, I eventually got to sleep at 1.30am. It was worth it though, the front end was much more planted in morning warm up the day after. Race 1…what can I say, it absolutely chucked it down minutes before we were due to go out. No spare bike on wets meant we had no choice to sit out the race. 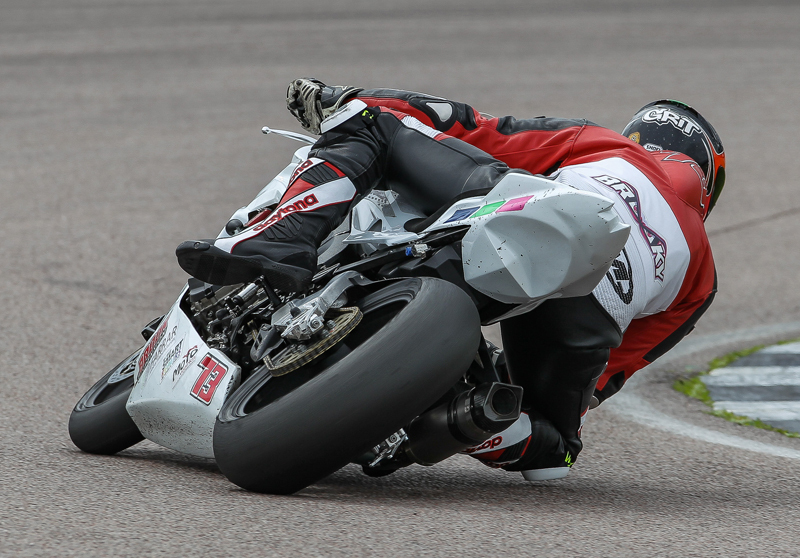 Race 2…I was adamant I could get a top 10 result from 18th with the improved feel. I sharpened my elbows and pulled 9 positions back in lap 1 to finish 9th. Every time I rode the bike I found more confidence in myself and all things considered I was happy where I finished. I’ve got a test booked before the next round to try and play catch up and hope to be nearer the front come Rockingham in a month's time! Sometimes you've just got to forget about positions and take stock. I’m racing, I’m bike fit and Im back to work having made a full recovery after an accident which could have ended my career. I'll live with that for now!